We started with an order of mussels. The house salad was fresh and generous. 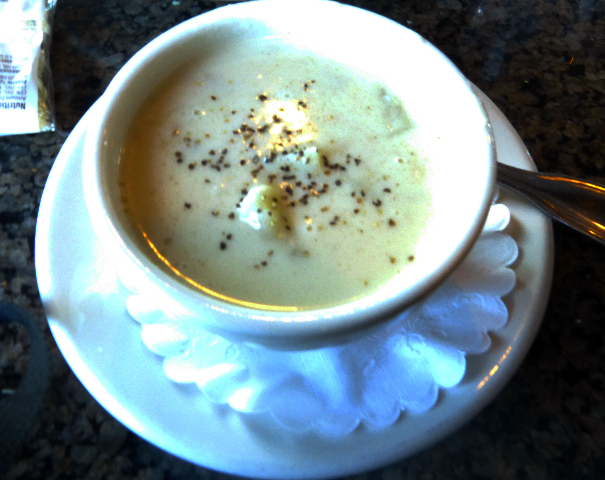 The clam chowder was pasty and generic. This entree left little to rave about. 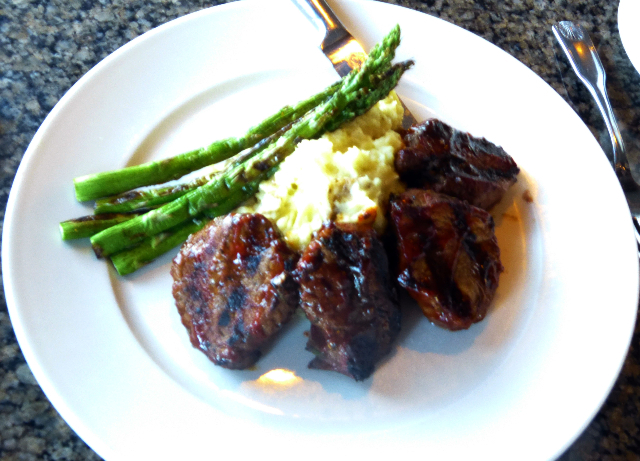 Steak tips proved to be a better dish. Friday Night Fish Fry $13.99 comes with house salad. 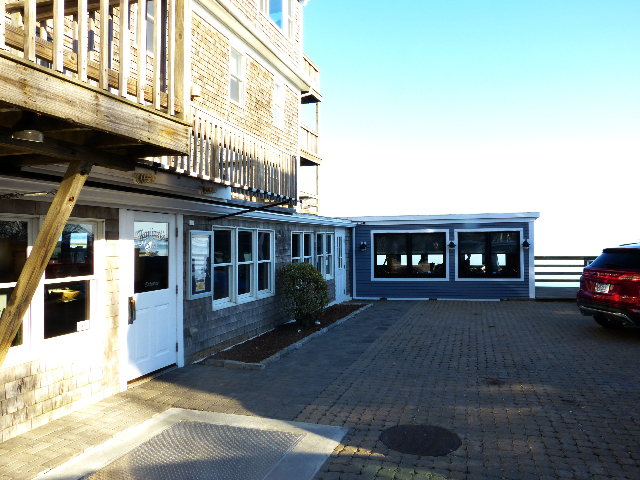 Through an April Fool’s blizzard we slogged our way to Provincetown on a Friday night. On Saturday we ventured out through sheets of rain for grocery shopping, raw oysters and mussels at Mac’s. At a buck apiece I had a dozen of Wellfleet’s best, small and sweet. The mussels by contrast were huge. The sun came out on Sunday for a bracing, hour-long walk on the beach. We cruised down largely empty Commercial Street checking for restaurants open so early in the season. Ciro’s and Sal’s is open on weekends but we have been there before. It’s pricey and Astrid finds it catacomb-like and claustrophobic. 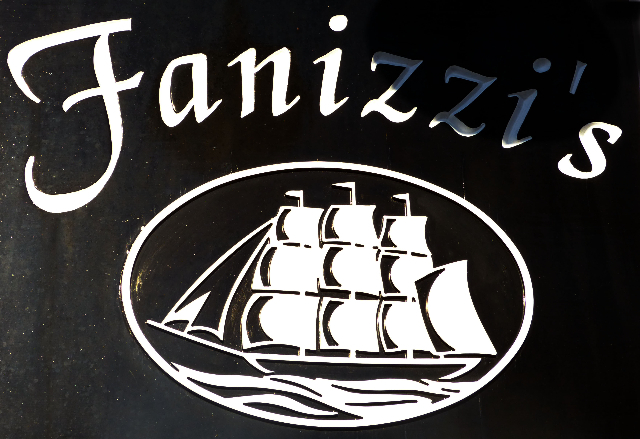 After several options we decided on an Early Bird at always popular Fanizzi’s by the Sea which is open seven days a week. 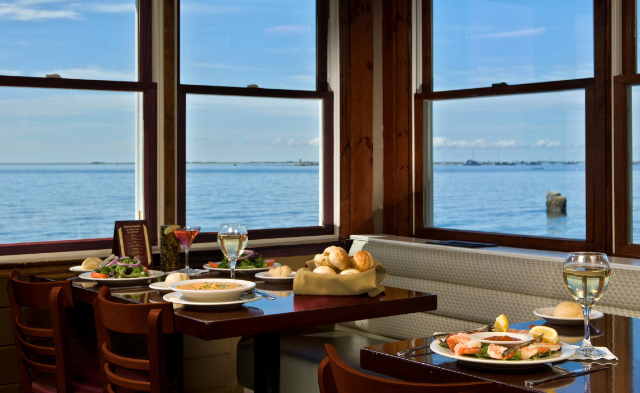 Its attractive dining room offers a view of the ocean. We arrived early enough for a window table. As the 6 PM cutoff approached the room gradually filled. 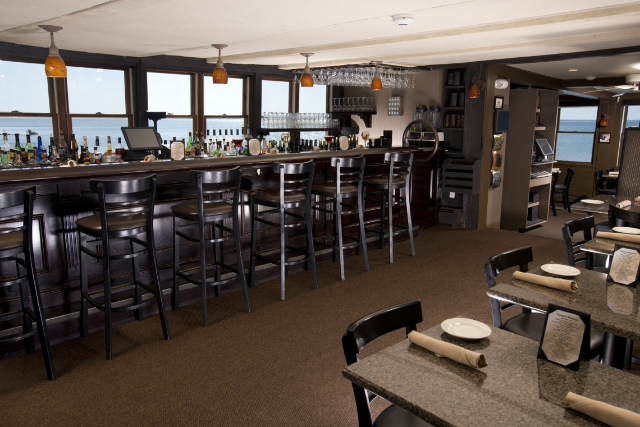 With a magnificent view, and just $15.95 for an entrée with choice of soup or salad, that’s hard to beat. 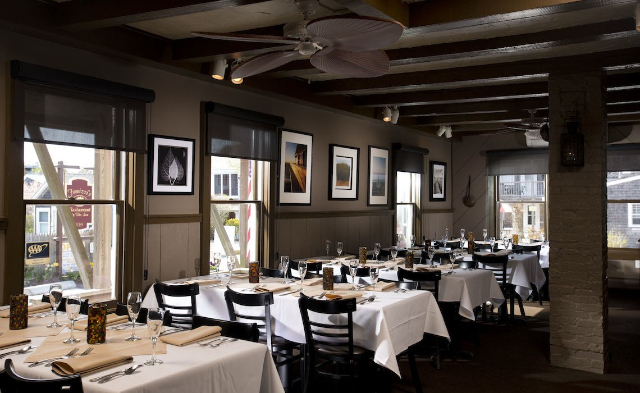 The options include: Mussels over linguine, meatloaf, chicken or eggplant parmigiana, pan seared salmon, or steak tips. 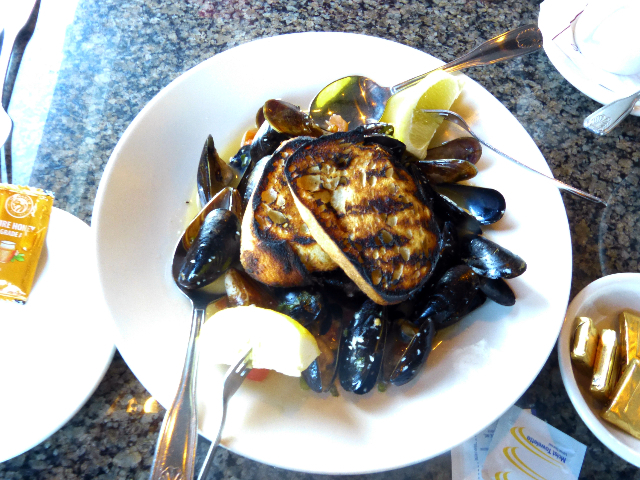 As an appetizer we shared mussels ($12.95). The portion was just adequate but deliciously sauced. It combined white wine, minced garlic, diced tomato and herbs. There were two slices of overly grilled crostini to slurp up the sauce. 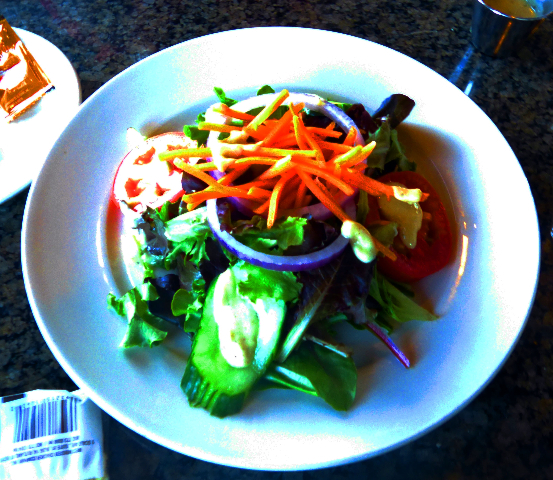 The choice of salad, fresh and generous, proved to be better than pasty clam chowder with more potato than clams. It seemed to come from a can; which is not what one expects in a fishing community. 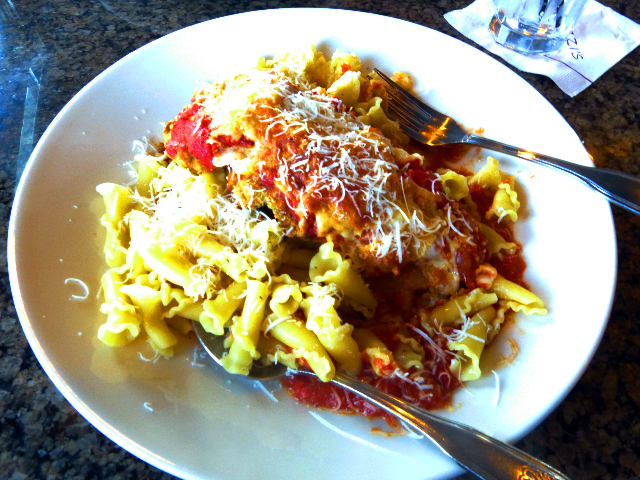 My entrée of eggplant parmigiana over pasta was sub par. The sauce did not cover the pasta and the portion of eggplant was tough and undistinguished. Astrid fared better with steak tips. They came with grilled asparagus and mashed potato. The serving was generous and she offered me one. The meat was tender and flavorful. Next time I would try the meatloaf or steak tips and a salad. While the cuisine was hardly spectacular the view is hard to beat.